I am fascinated by numbers at 16 years old I used to say I loved working with numbers, but that was before I did double maths for my A-Levels. I was good at working with numbers, more so than reciting facts verbatim, in fact before I got my ceramics degree my only qualifications were mathematics and sciences. Sometimes I think like about the cost of making something, as the cost of often selling something is higher, due to other factors and the fact I don’t sell means working out that final cost doesn’t bother me. This whole thought experiment started as I was talking to Michael Kline on blab.im and I said I had no clay so he suddenly became interested in how British Potters acquire their clay. I have often considered blending my own clay, maybe adding Lancashire clay into the mix but it is a longer process than buying it in for now. I started talking about the cost of a metric ton (1000kg) as that is the measurement here. My clay is £314 per ton (inc delivery and Tax), my wife’s clay costs £750 per ton (inc delivery and Tax), a clay with a similar description from the most popular company in the UK costs £687 per ton (inc tax, ex delivery). To me the outlay of clay always sounds a lot of money but when you say a ton would make approximately 3333 mugs or 2500 cereal bowls it seems like much better value for money. Obviously the cost of handmade ceramics isn’t in that part of the material, clay is cheap as dirt really. In fact if it weren’t such an outlay I would buy my wife’s brand of clay as it includes a nice grade of molochite grog throughout the body. My clay I add grog to which isn’t added to this cost and I approximate is going to cost an additional £170 but I can buy a bag at a time rather than having to buy all of them together and spread the cost out over a few months. Working out the cost of firing my kiln isn’t very hard either. My kiln is 3kW (kilowatt) for bisque firing it takes 9 hours for a glaze 10 hours. If it were using the full 3kW the entire time it would be 27kW/h (kilowatt per hour) or 30kW/h respectively. Coincidently a kW/h is also a unit of electricity in Britain; I can check my electricity bill and it will tell me the cost per unit, if my unit cost £0.20 (it doesn’t it is less than this) it would be £5.40 for a bisque and £6 for a glaze and that is the maximum cost. As far as I understand it the kiln doesn’t use 3kW the whole time always, so the overall price would be less. The price of the firing is divided between the number of items in the firing, giving a unit cost. 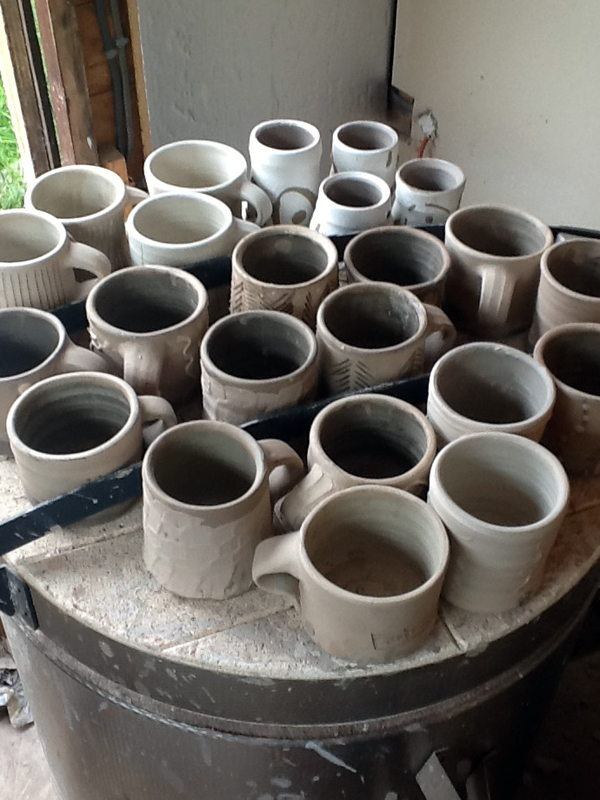 For example there were 26 mugs in each firing the cost per unit would be £0.21 in a bisque and £0.23 in a glaze firing or £0.44 for the combined cost of the two firings. £0.44 for firing once again isn’t a major cost, but that doesn’t include the cost of the kiln, or kiln maintenance. For firing the whole 3333 mugs in the ton though it would cost £1466.52, which is a lot more than either of the clays at this estimated cost per firing. Though this cost could be lowered by tumble stacking the bisque kiln to get double the amount of pots in. But for the though experiment we will keep it at this. To be honest this is the hardest figure to work out, I honestly couldn’t give you a figure as I don’t know how long a batch of glaze lasts, so working out how much it would cost to cover a ton I am not sure. I use the Leach 1-2-3-4 glaze so we could work out how much more than enough glaze would cost. And to be honest I think this amount would last me for years and over a ton of clay. The major price would be the cobalt oxide to go on top of all this, which is 0.5% of the total weight which would be 1.5kg. I also add 5% red iron oxide to help with the colour which is 15kg. Man time is slightly more complicated to work out. On my undergraduate design course we were given a module in business studies. During that course we were given some advice on pricing and having to work out costs. We were told the one cost everyone is always a bit iffy on is their own time in making an item. We were told we have to include that as a cost in case we have to employ someone else help make an item, as they will have to be paid for their time no matter what. I tend to prepare my clay and throw a dozen mugs in an hour, which is one every 5 minutes. But a mug can easily take almost 30 minutes by the time, you decorate, put on a handle, stamp it glaze it and so on. If we use Mug 21 from the lending library, but we will round the time up to 24 minutes, for me to completely finish 12 it would be 4 hours 48 minutes. 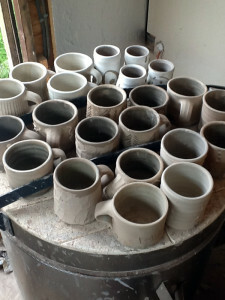 After that initial hour of preparing the clay and throwing a dozen mugs there is still almost 4 hours work left to do. This means that by far the biggest price per unit is how much a man hour costs. This means I need to know how many man hours this is going to take. So at 24 minutes a mug it would take 1333.2 man hours which at 40 hours per week would take 33.33 weeks to finish, which means 100 mugs are going to be finished per week. I think at that my kiln wouldn’t be able to keep up with the firings but that is another problem as it would take 8 firings a week and it takes at least 24 hours to fire and cool a kiln meaning 8 days to fire a weeks work. The numbers show the main cost of my making is definitely my time, as the combined costs were £0.64 per unit or £2217.60 for the run, even if bought a new shed, kiln and wheel would my costs exceed that of the minimum wage costs and not even the living wage man hour costs. These calculations don’t cover the cost of grog, slip or lustre but like the glaze I don’t know the cost would be close to but some of the other costs are higher than actual so I just left them as they were. The thing is for potters actually working there are other costs involved too, like marketing, photography, promotional materials etc. These are just my estimated thought experiment costs here in my small workshop. I could have done them for any form but it was easiest to do the mugs as they are recorded for the Lending Library. All these extra things take time, as does postage packaging or paying for a stand. Once you add these other costs on too, it a lot more money that you have to spend. The biggest problem I can think of though is how on earth would I sell three thousand three hundred and thirty three mugs in one year. This entry was posted in Learning, storytelling and tagged business studies, ceramics, clay, cost, costs, handmade, hands on thinking, mathematics, maths, Michael Kline. Bookmark the permalink.